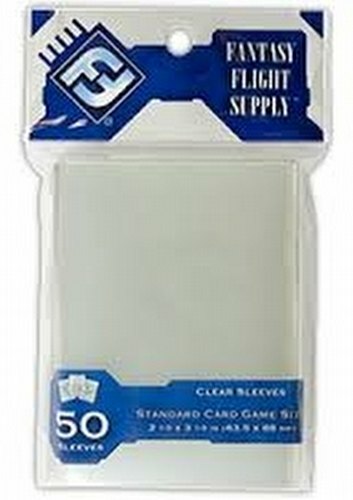 Each pack contains 50 sleeves. A perfect way to protect your LCG and other standard-sized cards (card size: 2 1/2" x 3 1/2" or 63.5mm x 88 mm), these standard card game sleeves keep your games safe in style. These sleeves are made of clear, 100 micron-thick, non-PVC, acid-free polypropylene plastic. This means that the sleeves are durable, difficult to tear or crease, and are free of chemicals that will corrode the cards within the sleeves. The sleeves are also designed to fit cards snugly, to make shuffling and handling easy.